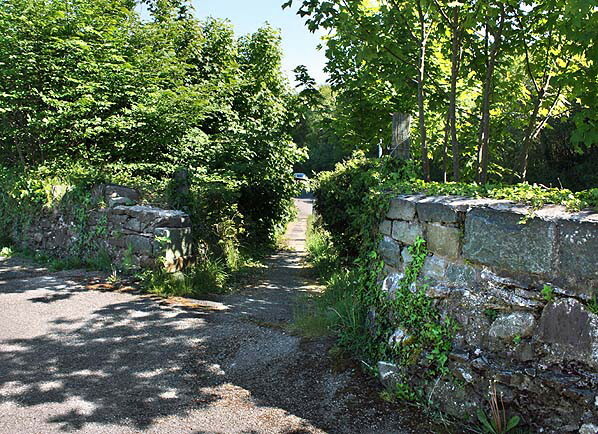 Location: On the Llanberis Road (A4086), in the Village of Cwm-y-Glo, 1.25 Miles from Llanberis, 6 Miles from Caernarfon. Present state: Demolished a by-pass road runs through the station site. 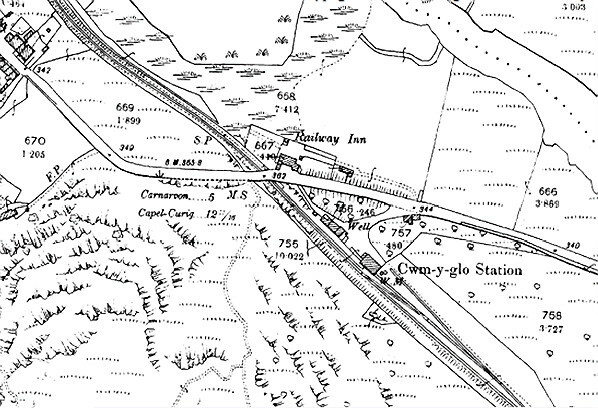 Notes: Cwn-y-glo was located on the Carnarvon & Llanberis Railway (C&LR) which was authorised on 14 July 1864. The line initially ran from Carnarvon Morfa to Llanberis and was 9 miles in length. Although the first sod was cut on 15 September 1864 progress was slow as the C&LR struggled financially from the start. During the 1866 financial crisis work on the line stopped completely. The London & North Western Railway (LNWR) offered to buy and complete the line using the threat of an alternative Bill as leverage. A compromise was reached the LNWR gaining 4½ miles of the line at the Llanberis end and running powers over the rest. Work began again and on 13 December 1866 there was agreement that the line should be jointly C&LR and LNWR. The branch opened for goods and passenger services on 1 July 1869. Cwm-y-Glo was the busiest intermediate station on the line for passenger traffic. The station served Cwm-y-Glo and its surrounding villages. It was situated partly in a cutting which was crossed by the original Caernarfon to Llanberis road. 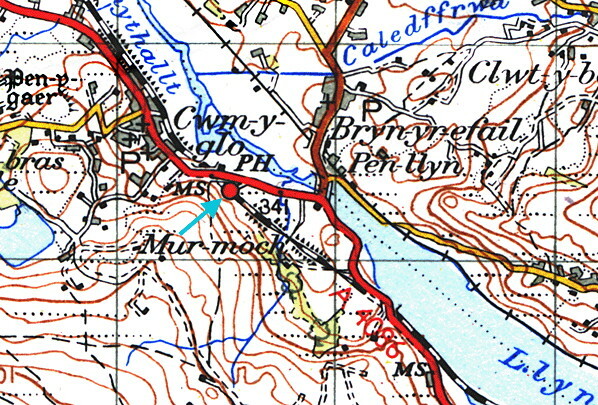 The station was located on a 1:144 rising gradient towards Caernarfon, just over a mile from Pontrhythalt. The design was similar to that of Pontrhythalt, but without a platform canopy, and included living accommodation, a booking hall and office, waiting room and toilets. The single platform, located on the down side of the track, was 320ft long, and of low construction as at all the stations on the line. Portable steps were always available to facilitate access to and from trains, if required. A public house was built next to the road bridge by the station, and there was a small shop at the station entrance. The station possessed a goods yard with two sidings, a large stone goods shed, and coal wharves situated at the Llanberis side, east of the line. The yard was entered by down trains. As there were no signals at the site, the points were controlled from a ground frame operated with the Pontrhythallt to Llanberis section train staff. Just before the station opened an accident occurred close to it. On a very hot afternoon on 30 June 1869, two carts each containing a ton of nitro-glycerine set out from Caernarfon travelling the 8 miles to the Glynrhonwy slate quarry on the edge of Llanberis. Although the canisters containing the liquid explosive had been carefully packed into boxes containing sawdust and covered in straw when loaded onto the carts, nobody at the time knew how inherently unstable nitro-glycerine was! A little before 6:00 pm, just after the carts had passed the Cwm-y-Glo station goods shed, the cargo exploded with what was probably the loudest man-made explosion ever heard up to that time. Both carters died, plus a passing quarrymen from Glynrhonwy and two young boys aged 11 and 13, who were unlucky to be nearby. The inquest showed that the carters had spent some time at the Alexandria Inn in Cwm-y-Glo which meant the carts were cooking nicely in the sun. No trace of the carters, horses or carts remained at the site and two deep craters approximately 10ft deep were left behind. Human and animal remains, as well as parts of the carts, were spread far and wide – with some of the debris being found in the neighbouring village of Brynrefail. The damage to Cwm-y-Glo’s buildings was extensive, many having roofs blown off and windows destroyed. Scarcely a house in the village escaped without damage. A wheel and harness from one of the carts landed half-a-mile away and, to this day, the spot is marked by a large ‘X’ scratched on a stone wall which local people keep visible. The far-reaching consequence of this event was the Nitro-glycerine Act 1869 prohibiting the manufacture, transport or sale of nitro-glycerine or any product containing it in the U.K.
A plaque commemorates the event which can be seen on the rock face opposite Y Fricsan. From July 1870 the line had become wholly owned by the LNWR. The summer timetable for 1887 showed six trains in each direction running between Caernarvon and Llanberis. Services were always fewer in the winter months: the December 1895 timetable showed four trains in each direction running between Carnarvon and Llanberis. In 1897 the Snowdon Mountain Railway (SMR) opened which brought excursion trains to the line but they mostly ran fast through Cwm-y-glo and served only Llanberis. Excursion trains did also run from the line and served the station. The April 1910 timetable showed six scheduled trains in each direction, but by July 1922 this had increased to seven on Monday-to-Friday and eight on Saturdays. On 1 January 1923 Cwm-y-glo became part of the London Midland & Scottish Railway (LMS). By July 1929 the LMS was running ten trains in each direction on Monday-to-Friday and twelve on Saturdays. There had been strong competition from local bus services since the 1920s which adversely affected revenue. The LMS withdrew the Caernarvon and Llanberis passenger service on 22 September 1930. Summer-only excursion trains ran between Caernarfon and Llanberis from 25 May 1931, and from 1934 they even ran on Sundays; Cwn-y-glo was not a scheduled stop. From 29 December 1934 an all-year-round Saturdays-only service was introduced between Caernarvon and Llanberis, and it may have called at Cwm-y-glo but the station was not shown in the public timetable - it was in the working timetable. On Saturdays a market was held in Caernarfon and the service was operated for local people. With the outbreak of the Second World War on 3 September 1939 an emergency timetable was introduced from 12 September. The market day service caesed and was not reintroduced when hostilities ended. On 1 January 1948 Pontrhythallt became part of British Railways London Midland Region. Excursion services were reintroduced from the summer of 1948 but they did not serve Cwm-y-glo. There were daily goods services in the early 1950s. It was typical to carry out some shunting at Caernarfon before departing up the branch, when around half-an-hour was spent at Cwm-y-glo. Llanberis was usually reached at 10:10 am, and on arrival at the yard shunting was completed, before cleaning the fire. After those duties were complete there was enough time for the crew to have a bite to eat. The return working was at 11:05, arriving at Caernarfon at 12:50 with intermediate stops at Cwm-y -glo and Pontrhythallt, as on the down journey. After completing any further operations that were required at Caernarfon, the loco would then work light engine back to Bangor. By the late 1950s the goods service had become less frequent. The last goods train ran on the line on 7 September 1964 after which it closed completely. Track-lifting was carried out in the early months of 1965. The goods yard at Cwm-y-glo was used during this operation to stable the wagons which carried recovered materials away. The yard remained in use until track-lifting reached Cwm-y-glo; thereafter locomotives had to push trucks up to the railhead. 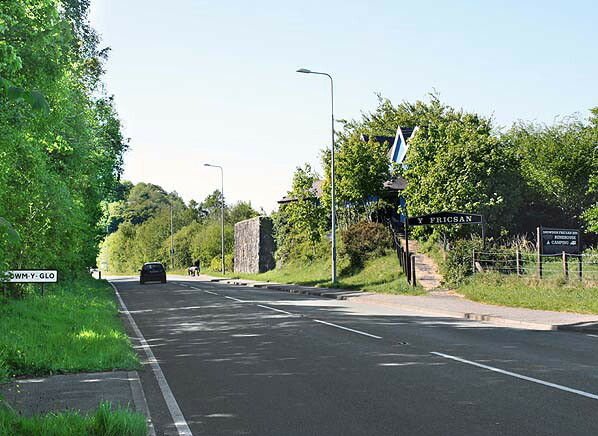 The road bridge and station building were demolished in the early 1980s when a by-pass road was built along the course of the railway at Cwm-y-glo as part of the main Caernarfon to Llanberis road. The goods yard area has been redeveloped as a council depot. Timetable from Nick Catford and route map by Alan Young. 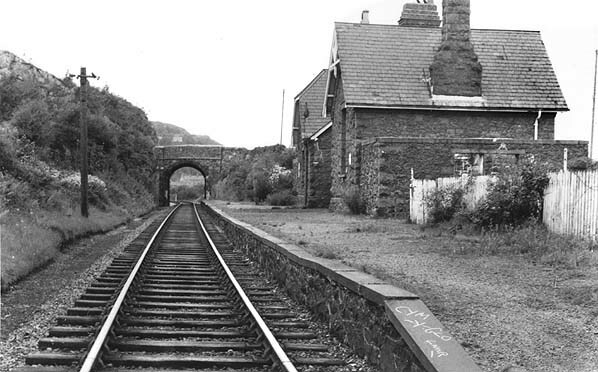 Cwm-y-glo station looking north-west in the early 1960s. The station had been used by Sunday School excursion trains in the 1950s and was still open for goods when the photograph was taken. 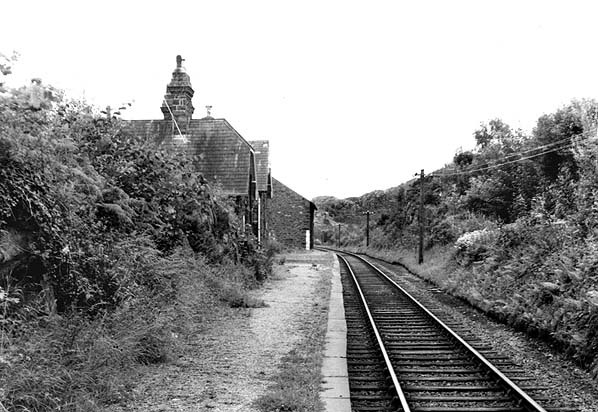 Looking south-east along the platform at Cwn-y-glo station in the early 1960s. The site of Cwm-y-glo station looking north-west on 25 May 2012. The remains of the bridge that carried the original road over the line to the north of the station can be seen in the middle distance. Looking down the ramp that provided a pedestrian access from the road to the platform at Cwn-y-glo station seen on 25 May 2012. Cwm-y-glo station pedestrian entrance gate seen on 25 May 2012. The site of Cwm-y-glo station looking south-east on 25 May 2012.